Due to slow wage growth, housing affordability remains a concern for 2019. Although inventory is poised to improve in 2019, homes that become available may prove to be too costly for first-time buyers. The National Association of REALTORS® forecasts 2019 sales to increase only slightly to 5.4 million nationally (a 1 percent increase over 2018). The national median existing-home price is expected to rise to around $266,800 in 2019 – a 3.1 percent increase from 2018. Locally, for the period spanning January 2018 through December 2018, the overall median sales price was up 6.0 percent to $212,000. The property type with the largest price gain was the previously owned segment, where prices increased 5.0 percent to $198,250. The price range that tended to sell the quickest was the $225,001 – $400,000 range at 52 days; the price range that tended to sell the slowest was the $125,000 and below range at 80 days. In December, the median sale price in the Capital Region dropped by 8 percent to $204,362. 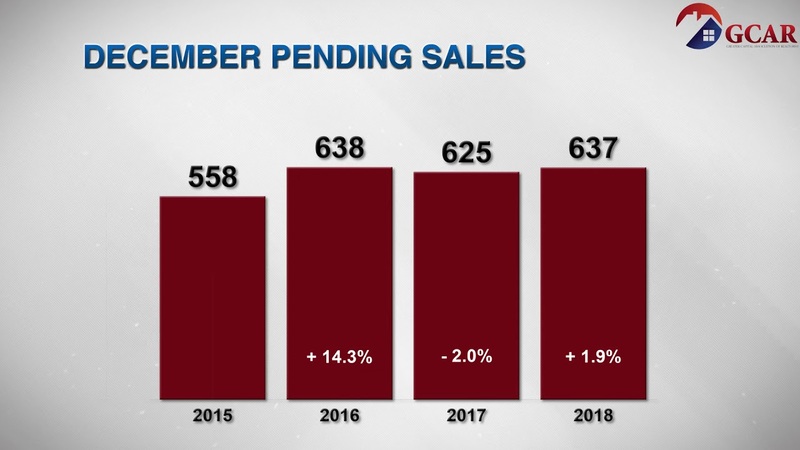 Pending sales increased 2 percent from December 2017 to 635 for the month. Homes were spending and an average of 54 days on market, which is a 21 percent decrease from December 2017 – indicating that even though prices are on the rise, homes are still moving off the market quicker than they did at this time last year. Closed sales decreased 17 percent from December 2017 to 840 for the month. Sales were down compared to this time last year, bearing out the widespread notion that buyers are more willing to wait for price breaks at a time of lowered housing affordability. Greater Capital Association of REALTORS president, Jay Christiana, of Berkshire Hathaway Home Services Blake Realtors, commented that “While our local inventory levels decreased last month, even the small increase in new listings should begin to bring some relief in the first quarter of 2019.” Inventory remains down in year-over-year comparisons, 5.2 percent to 4,552 units. On a positive note, there were 734 new listings last month – a 1.4 percent increase over December 2017.